Texas Instruments introduced in the United States with the BA-20 already in 1986 a very useful calculator. 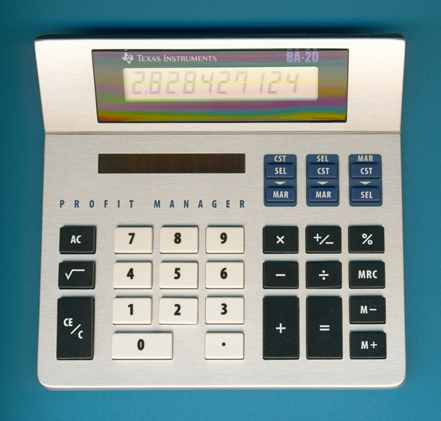 Beside the basic calculator functions six additional keys enable the COST, SELL, MARGIN calculations. You enter either two of the variables and get instantly the result of the remaining value. Dismantling this BA-20 manufactured in August 2006 reveals no major differences to the previous model of the BA-20 introduced in 1998 and sporting smaller solar cells. Even the Integrated Circuit makes use of a traditional housing instead the then common Chip-on-Board (COB) technology. © Joerg Woerner, January 20, 2011. No reprints without written permission.